The route for the World Solar Challenge – roughly 3,000 km or 1,900 miles of it – runs through the places listed below. The graph below shows very approximate altitudes from coast to coast (estimated using straight-line interpolation between towns). 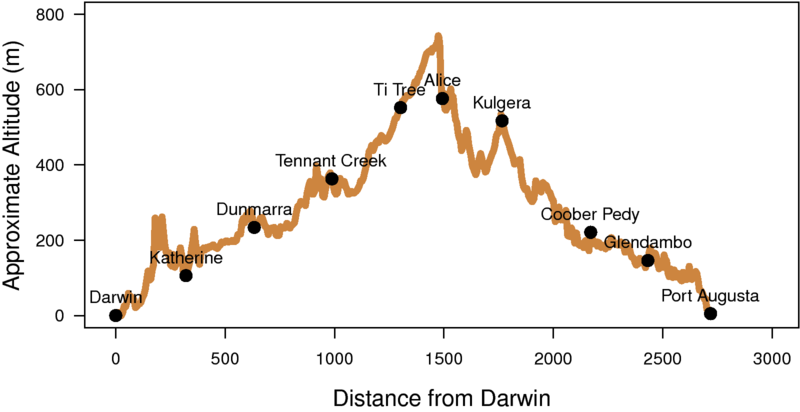 The highest point on the route (about 730 m) is 20 km north of Alice Springs, although the steepest hill (Hayes Creek Hill, summit 203 m) is about 170 km from Darwin. The icons below are clickable links to Google Maps. The city of Darwin marks the start of the race. The town of Katherine (on the Katherine River) is a gateway to Nitmiluk National Park. It also serves the nearby Royal Australian Air Force base. The average maximum October temperature is 37.7°C. Dunmarra once served the Overland Telegraph Line. Today it is little more than a roadhouse, motel, and caravan park. 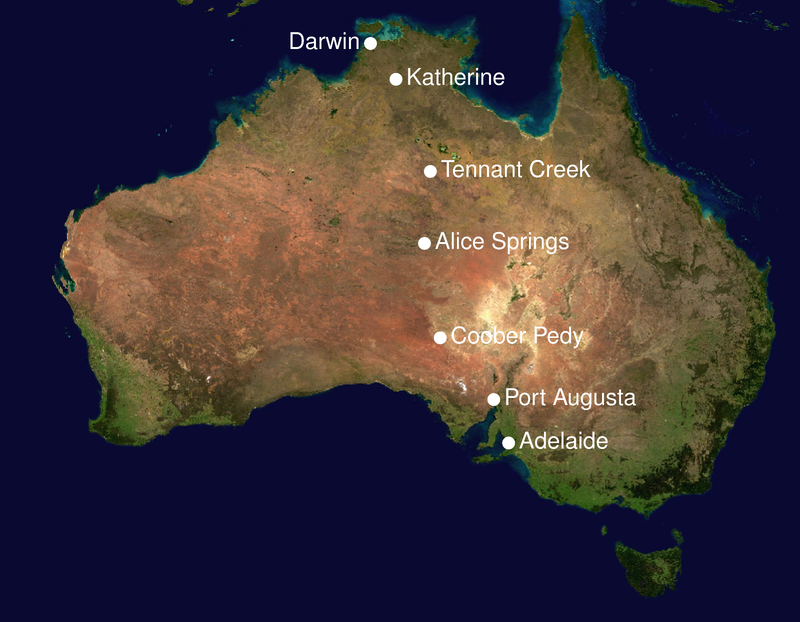 Tennant Creek (population about 3,500) is a small town serving nearby mines, cattle stations, and tourist attractions. The 1,802 hectare Karlu Karlu / Devils Marbles Conservation Reserve lies along both sides of the Stuart Highway about 100 km south of Tennant Creek. It is home to a variety of reptiles and birds, including the fairy martin (Petrochelidon ariel) and the sand goanna (Varanus gouldii). Race participants, of course, don’t have time to look (unless, by chance, this is where they stop for the night). Barrow Creek once served the Overland Telegraph Line and nearby graziers, but is now nothing but a roadhouse. The Telegraph Station is preserved as a historical site. Ti Tree is a small settlement north of Alice Springs. Much of the local area is owned by the Anmatyerre people. In previous races, this was a control stop. 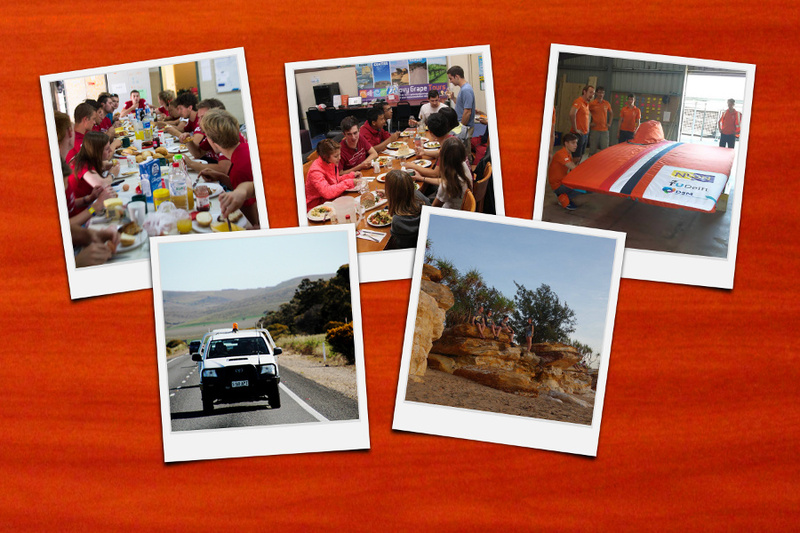 Alice Springs marks the end of the first stage for cars in the Cruiser class and Adventure class. Kulgera is a tiny settlement 20 km from the NT / SA Border. The “pub” is Kulgera’s main feature. The sign at the Northern Territory / South Australia border shows Sturt’s Desert Pea (Swainsona formosa), the floral emblem of the state of South Australia. The town of Coober Pedy is a major centre for opal mining. Because of the intense desert heat, many residents live underground. Glendambo is another small outback settlement. At Port Augusta, the highway reaches the Spencer Gulf. From this point, traffic becomes much heavier, which makes life more difficult for the drivers in the race. Adelaide, the “City of Churches,” is the end of the race. The official finish line marks 3,022 km from Darwin (timing appears to stop at 3,020 km, rather than on the outskirts of Adelaide as in previous years, but the route notes are a little unclear on this). 11: Bochum University of Applied Sciences (  Germany, SunRiser) – in Darwin, see their latest (German) blog. They have adopted a baby wallaby, after finding its mother dead beside the road. 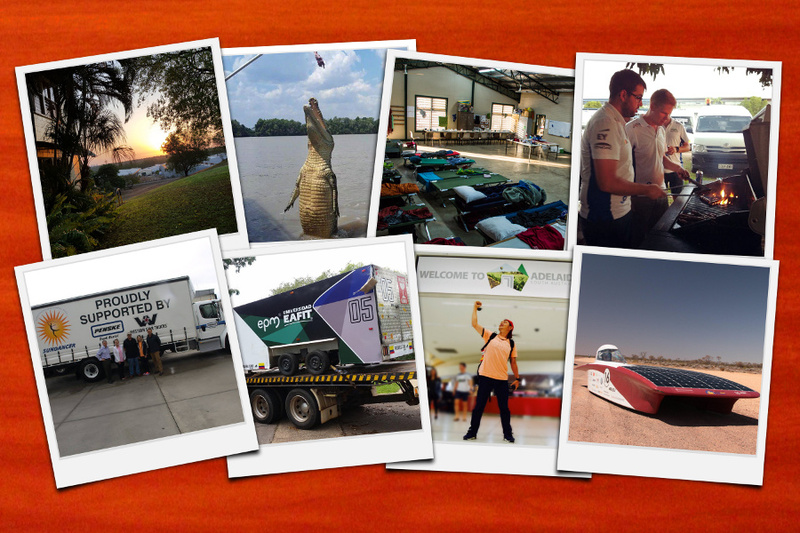 5: EAFIT-EPM Solar Car Team (  Colombia, Primavera) – have departed Colombia. Their car is in Darwin. 21: Solar Team Twente (  Netherlands, Red One) – in Darwin, making some interesting blog posts. They have just had a green light to test-drive on the Cox Peninsula Road. 23: Kecskemét College Faculty of GAMF (  Hungary, MegaLux) – they are in transit to Australia. Their car is already in Darwin. 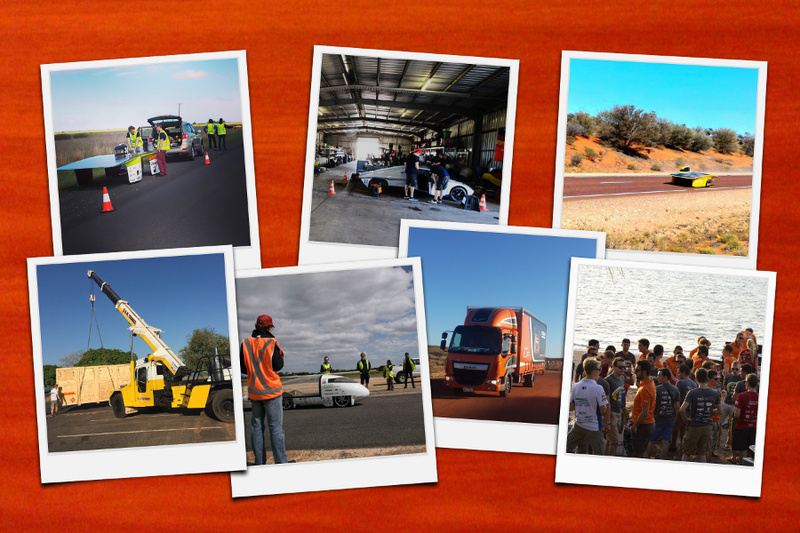 20: Houston School District (  USA, Sundancer) – an adult advance team will be trucking the car from Sydney to Darwin, where the students will join them just before the race. Last report mentioned quarantine delays. Instead, decide to build, test, and race a solar car. Those last two steps should not be afterthoughts. In particular, testing and race preparation take time – serious time. The top teams will generally run some kind of simulated race before the real thing, and will typically reconnoitre the Darwin–Adelaide route ahead of time as well (usually in reverse). Several teams are doing that this year. By that I mean a group of like-minded individuals. Instead, what you need is a team – one with a diverse range of expertise. For example, in 2013, Team Nuon included a wide range of skills, including engineering, operations research, race strategy, media, and PR. A successful team needs the right leader, and it also needs appropriate team-building activities to help mould members into a true team. This needs to happen at the start of car design, but also at the end of construction. 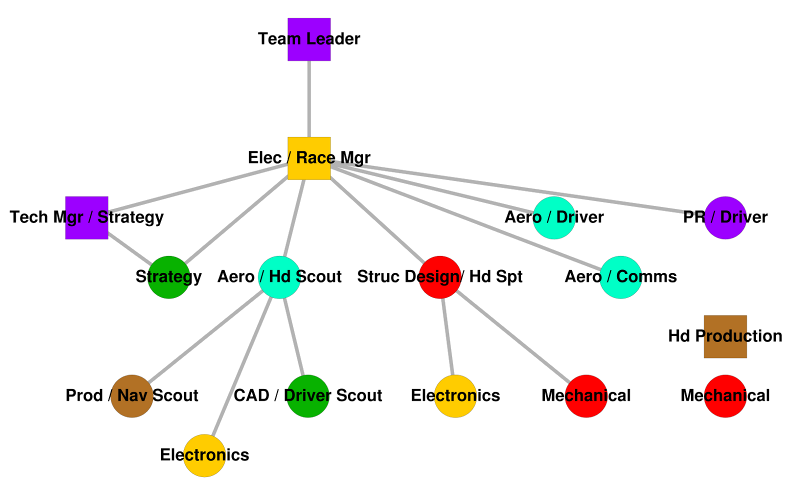 Even if exactly the same people are involved, the “build team” and the “race team” are different teams, because they are structured differently. Several of the less-experienced WSC 2015 teams have reported interpersonal frictions that revealed themselves during early road testing. These are things that need to be resolved before the race! First time around, mistakes are always made. So learn from those who participated in previous races – either from team alumni (this post by Michigan highlights the importance of team continuity) or (for new teams) from teams elsewhere. Some new teams this year seem to have done that quite well, judging by some excellent first-time-around designs. Following up from his previous guest post about the Challenger class, today Nigel, our UK-based guest blogger, explains why Team 43 is his favourite in the WSC Cruiser class. Moving on to the Cruiser Class and my second choice. Two weeks ago it was simple, Bochum’s SunRiser is the best looking solar car I’ve ever seen and I hope it wins the event. But then, gradually, my new favourite began to emerge from the shadows – Ardingly College’s imaginatively named Ardingly Solar Car. And perhaps that is why I like this car so much, it leaves very little to the imagination – it’s a solar car and it was made in Ardingly. Furthermore you can see just how it was made, no secrets here – it’s all on show. I first heard about this project three years ago when the school visited CUER and announced that they were going to build a solar car to race at WSC. Now, lots of teams say that they are going to do just that and many times they do not get anywhere near. I took their promises with a pinch of salt. 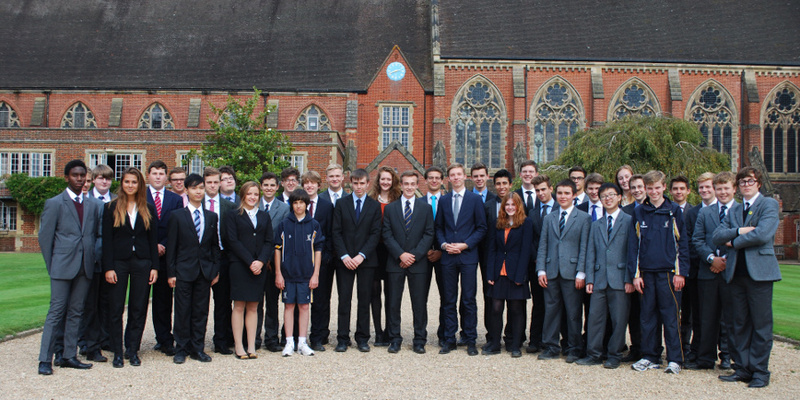 Then, in June, the WSC Team List was published and there in the list of Cruisers was Ardingly Solar. I re-visited the team’s website that I had stopped even looking at ages ago and, sure enough, very little had changed. Obviously the team had forgotten to withdraw their initial application but, just in case, I e-mailed the team to find out what they were doing. They replied and I put them in touch with Jeroen Haringman at solarracing.org and we received a picture of a chassis. 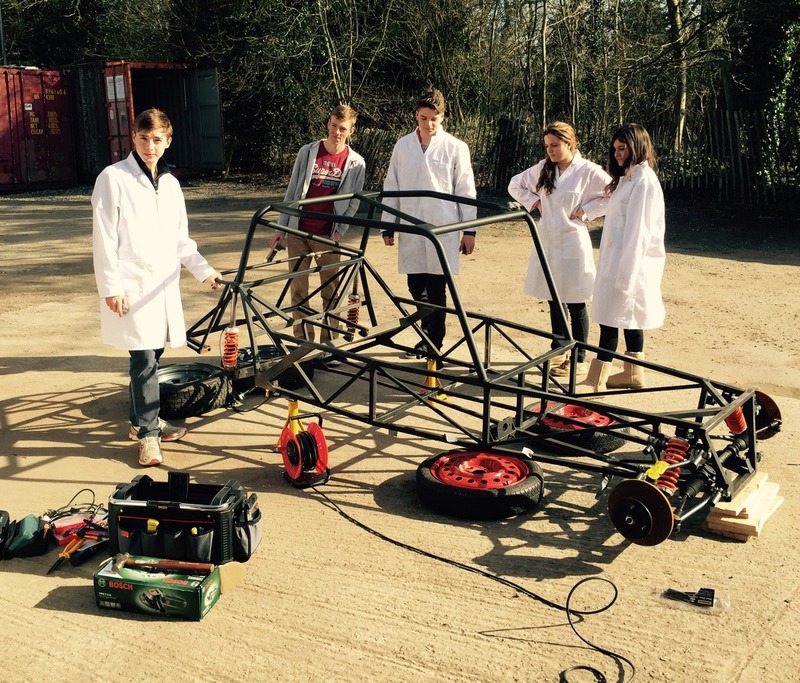 This was taken in April 2015, the team are secondary (high) school students and all they had was a steel frame, obviously there was no way that they would make it to Australia. Well, consider my hat well and truly eaten. The car is on its way, the team will follow soon and that steel frame is the reason I like their car so much. I like High School Solar Teams in general, I like the honest engineering of their cars. By and large they are not able to secure huge sponsorship deals or to work with large manufacturers so they have to find different solutions. In Ardingly College’s case that solution was the Lotus 7. You can find plans for a Lotus 7 chassis very easily on the internet, copy it and you know it will work. Add a few bits for safety and you are away. 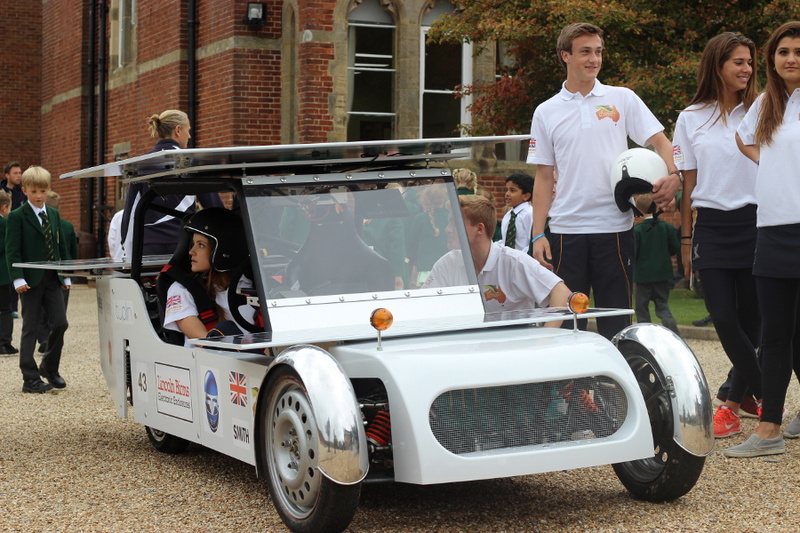 Ardingly did just that, then they made some panels for the side, they added a motor, some batteries and some seats, stuck on some solar arrays and turned out a beautiful little car. I know it is not as simple as I make it sound, it takes hours of hard work and some very special people who are prepared to share their knowledge for nothing but to help a few youngsters. Those youngsters also have to be very special to carry it through but now I’m sure they will find it was worth it. They won’t win this race, they will do very well to even keep up with the pace they need to avoid putting their car on the trailer but they should know, as they sit on the start line in Darwin, that what they have done already is remarkable. But if they have made a car that is driven by electric motors, that has batteries that can be charged by the sun and can drive for more than 40 miles per day then they have made a car that suits the needs of most people. And if this is the start just imagine where we might finish. Today we have a guest post from Nigel, a UK-based solar car fan. He explains why Team 12 is his favourite in the Challenger Class for this year’s World Solar Challenge. A follow-up post will give his view of the Cruiser class. Over the past few years I have written a few posts about Solar Cars and Solar races and I have always tried to follow the rules on impartiality. 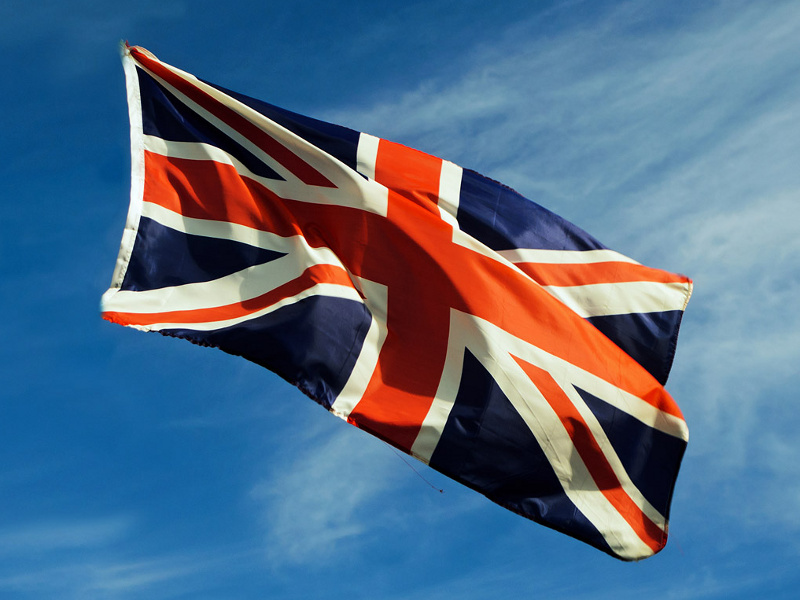 In any case, being from the UK which has a pretty poor record of success in the sport, it is relatively easy not to blow our own trumpet too loudly. Therefore, if you are prepared to read further, you can be sure that as I explain my choice of favourite cars at this year’s WSC you can be sure that no jingoism is involved. Before I go any further let me be clear, these are not the cars that I am suggesting will win the event. Anything can happen in solar racing and maybe both cars are capable of completing the course but I think it would take a LOT of mishaps to other teams for either car to even get close to the top five. No, these are the cars that I like for other reasons. My first choice, in the Challenger Class, is Evolution from the Cambridge University Eco Racing team. There are several reasons why I like this car and the first is simple – it is not a Catamaran. In the past all sorts of weird and wonderful shapes of car have turned up at WSC and events around the world with varying levels of success. This year, however, 29 of the 30 teams in the Challenger class have brought what we now call catamarans with the only differences being where the driver sits and how many fairings they have. I do not blame the teams, clearly it is the case that cars have evolved like this because it is a design which best answers the criteria given in the rules of the event. So, some cars will better designed, with more aerodynamic features, and some will have a better finish than others but we can be almost certain that a catamaran will win the race. That’s fine, there are lots of areas that teams can focus on to move the sport, and engineering, forward such as weight reduction, battery technology, energy efficiency and so on – but all of that is hidden from view. What we see is one catamaran after another, different colours, different teams but still catamarans. Thank heavens for Evolution. When CUER made their car called Resolution for the 2013 running of the event it was quite a departure from the norm. The car was tiny, made possible because it used Gallium solar cells, it was bullet shaped and the array was inside the car. Ok, it was not built as well as it could have been and events proved that the design went too close to the edge of what was safe. But thankfully we still have young people who are prepared to test where the edge is, not by gradually moving closer to it but by standing on the edge and then moving backwards. This is what CUER did and Evolution is a very aptly named car. This car is wider and lower than its predecessor and the team claims that it has the same, or better, aerodynamic performance. The centre of gravity has been lowered and moved in relation to the centre of roll. It is also much better finished than Resolution, is easier to drive and, the team claims, uses less energy. Some might claim that it is stubbornness that made this team persist with this design, I prefer to call it determination and here’s why I’m glad that they did. WHY, WHY, WHY, have this rule? The most practical car carries one person! Let me explain, I have a wife and two adult children. We all work in different places at different times and we go out to different places so we have a car each. Our cars are made to carry a total of 19 people so, for most journeys, that’s 4 people, 4 cars and 15 spare seats. Add in my neighbours and we have 10 cars, 12 people and 39 spare seats. So, all of these extra empty seats and all of the extra metal needed to enclose then is being carted around the country day after day. What we need are small single occupant cars for the vast majority of journeys and, I believe, Evolution is closer to answering that need than Nuna8, Tokai Challenger or any other catamaran. The organizers of WSC may not thank me for saying this but the solar part of this challenge is a gimmick. It’s a necessary gimmick – if this was the World Electric Car Challenge it would have died a death years ago – and it provides a great place for engineers to advance their knowledge but, in reality, the best place for solar cells is on the roof of your house. Yes, the catamarans are needed to keep this fantastic event alive but they are not the future of transport. For that we need to look to EVOLUTION. Team 80, from the Beijing Institute of Technology, is entered in the Challenger class, but appears to have no online presence at all, and so their status is a little uncertain.